From the writer of The Monk Who Sold His Ferrari, this new offering leaves readers with 101 solutions to life’s most challenging hurdles. 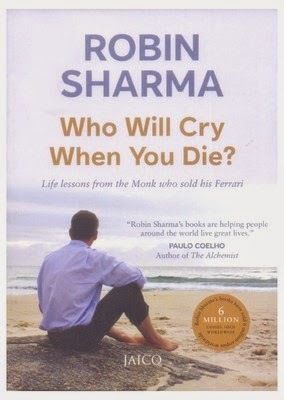 For anyone seeking help to live a more enriched and free life, Sharma guides readers through a path of evocative ideas. Who Will Cry When You Die? is a definitive voice of the human spirit that doesn’t just grapple with the mundane but the higher purpose of a legacy. In the pursuit of material accomplishments and tangibles, people often forget their inner voice. This is where Robin Sharma steps in with this self help book. What about the pursuit of happiness then? For everyone looking for inspiration to lead a more meaningful life and seeking out newer horizons that seem far away, this book takes them on a life altering journey. The method employed by Robin Sharma is making readers look at life with a glass half full approach that is infinitely more rewarding. The book has a number of lessons that are bound to push readers into a more thoughtful plane from where self discovery is the inevitable goal. Sharma eggs readers into truly discovering their calling through one lesson. Another deals with deeming troubles as blessings instead. In another chapter, he asks readers to enjoy not just the end but also the journey that leads to the final objective. The stories are more often than not employed with a number of personal observations and experiences which render the content more real. The chapter “Speaking kind words” is a simple take on responsibility towards other people and in exploring the power of affirmation. Some other chapters involve the concepts behind diverse matter like “Find three great friends” and “Use your commute time'. The chapters are short, but carry a lot of life affirming lessons that work as a refresher to whet the appetite of any wandering mind to think more deeply about the content at leisure. Who Will Cry When You Die? is a book for anyone who wishes to live a beautiful and fulfilled life. The book was published in 1999. Robin Sharma is a leadership expert, lawyer and author. He has authored over 15 books including the international bestseller, The Monk Who Sold his Ferrari, The Gandhi Factor, The Leader Who Had No Title, MegaLiving! and Begin Within among other books. He received his L.L.B. degree from the Dalhousie University School of Law in Canada. He is the founder of Sharma Leadership International in Toronto. A motivational speaker, he has been honored with the Golden Gavel by the Toastmasters International in 2011. He was also ranked number 7 on the International Leadership Professional Gurus graph in 2012.